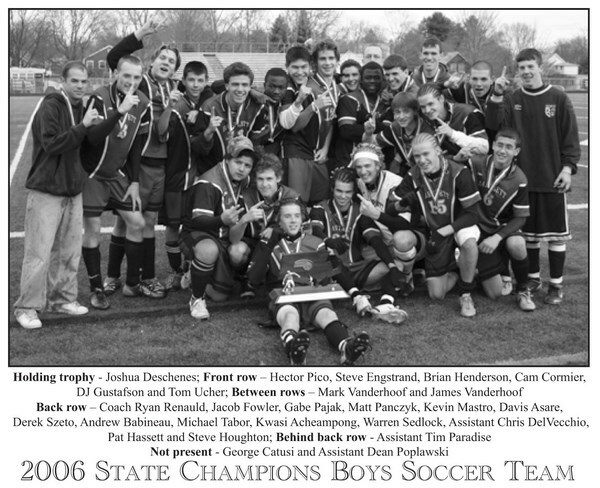 The 2006 Bartlett High Boys Varsity Soccer Team reached heights that no other soccer team in its 47 year program had accomplished-- winning a Massachusetts State Championship! The 1979 Boys Varsity Basketball Team is the only other team in the school�s entire athletic history to do so! After losing seven seniors and falling short of their goal in a hard fought battle the previous season to Bromfield High School in the District Finals, the team entered the 2006 season with one thing on their mind, winning the Districts. Through the leadership of their five captains, James Vanderhoof, Cam Cormier, Steve Engstrand, DJ Gustafson and Josh Deschene, the group became more of a family than a team. The team�s tremendous offense was led by outstanding senior forward Brian Henderson (37 goals and 15 assists), junior forward Jacob Fowler (4 goals and 3 assists), senior midfielder James Vanderhoof (8 assists) and junior midfielders Josh Deschene (14 goals and 7 assists), Kwasi Acheampong (10 goals and 8 assists) and DJ Gustafson (4 goals and 8 assists). After graduating their entire defensive unit the previous year, the 2006 �Rookie Defense� was led by senior sweeper andMIAATournamentMVP Steve Engstrand, a solid pair of juniors, Andrew Babineau and Michael Tabor, as well as an upstart freshman, Tom Ucher. Senior goaltender, Cam Cormier, who posted a career-high 11 shutouts, including 4 out of the 5 tournament playoff games and only surrendered a lone goal throughout the tournament, may be most remembered for his three diving saves in penalty kicks to avenge the loss to nemesis Bromfield High School and win the District Title. On November 18, 2006, these 22 outstanding soccer players played with heart and determination and their usual passion �one more time,� making sure that award jacket said �Champions� and won the 2006 Massachusetts State Championship, finishing with an outstanding 18-3-2 record!